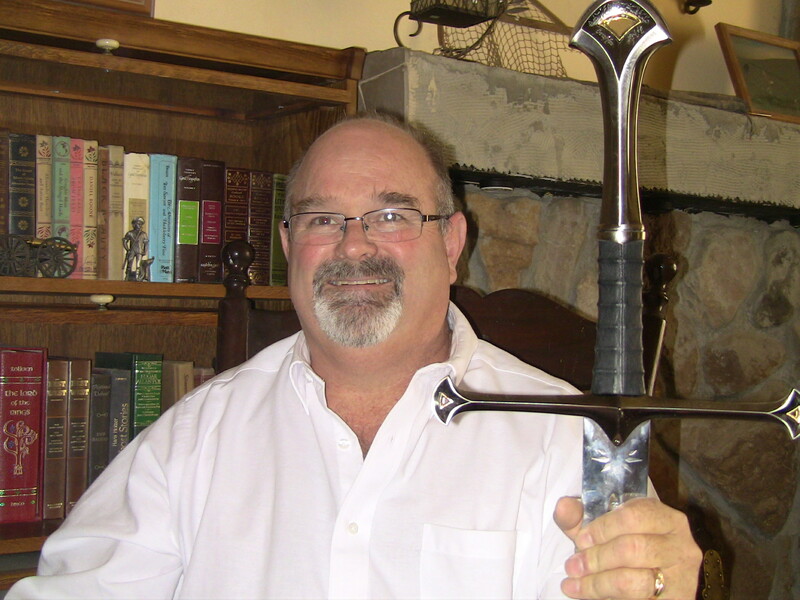 Please meet the Fantasy Sci-Fi Network’s Author D.M. Stoddard! Welcome Dennis. Tell me about The Legend of Jerrod? The inside cover of the hard back edition has information on the world of Dendür that is not available in the paperback and eBook versions. In addition to the storyline in all three formats, there is History and Arms section. The History and Arms section provides information on the territories, cultures, armies, and weapons the reader will experience. The section also has a map of the areas Jerrod and his friends travel through. The Legend of Jerrod was published through Friesen Press, who allowed me to keep all rights, and is distributed through Friesen Press, Amazon, Barns & Noble on-line, and others. Pricing varies between distributors. The first few chapters of The Legend of Jerrod set up the world of Dendür and the fundamentals of the life style and countryside. Then Jerrod, an eighteen year old who dares to become more than just normal, begins his adventures of seeking fame and fortune. Torrence is a kingdom where two secretive organizations strongly influence life: The Triad, a group of wizards who study three of the five forms of magic, and the Guild of the Crimson Pommel, a group of thieves and assassins. While most of the citizens of Torrence follow the Olympians, a new religion, The Order of One, is beginning to overcome the Olympian following. Jerrod is befriended by a beautiful female warrior, Amanda. Through Amanda he makes friends and together they seek a secret treasure they believe to be hidden in Terrace Xul. Accepting help from Rhonda, a half-Elvin druid princess, and her guardian, Imelrinn, they fight together to survive. While Jerrod is torn between his love for Amanda and Rhonda, treachery grows within their ranks. The Legend of Jerrod includes men and Elves, dragons, giants, trolls, ghouls, and other beasties that challenge the group in battles of magic and steel. I started writing short story fiction about the age of eleven. I turned to poetry during high school and continued through college. In my twenties I started writing game scenarios for my friends in D&D worlds I created. While my children were young I told them impromptu bedtime stories of forest animals playing together in the woods. After I completed my master’s degree I decided to write a book in hopes others would enjoy my stories. I find writing is an emotional release that frees you from the pain and challenges of life and provides enjoyment for others. I am fortunate that my family supports my escaping for a few hours, from time-to-time. I am working on the manuscript for book two of the series, Amanda’s Quest. I have submitted the first ten chapters of the manuscript to the beta readers who are now pressing me for more. I am making the final review of chapters eleven through fifteen to submit to those chapters soon. Amanda’s Quest will include a map that is twice the size of the map in The Legend of Jerrod and may include a map from the Haithenbeurn perspective. Haithenbeurn is a northern kingdom that follows the gods of Asgard. I am preparing to paint the item (secret) that will be on the cover of Amanda’s Quest. Like the sword depicted on the cover of The Legend of Jerrod, I anticipate using watercolours. I am also working on a book trailer for The Legend of Jerrod and possibly a music video which I hope to release in the summer of 2014. I have notes for book three and concept papers for books four and five. I couldn’t find illustrations or photos that fit the book’s storyline. Nothing came close to the description of the characters or the Sword of Trisdale that plays a big part in Jerrod’s development. So I explored contracting illustrations and photographs, but they were proving to be both too expensive for an indie budget and were still limited in trying to represent the characters and magical items in the book. I was an artist in high school and studied architecture for a while in college. So, deciding to test myself, I went down to the local art store and bought some professional art supplies. 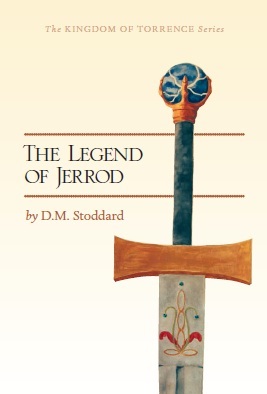 Three days later I finished the Sword of Trisdale which is depicted on the cover of The Legend of Jerrod. The cover layout was developed by Friesen Press. When I decided to publish I started researching the process. I spent about two years researching self-publishing companies and started sending query letters to literary agents. I read about the “do’s” and “don’ts” authors should consider, and then proceeded to do everything wrong despite myself. I submitted works too early. I rushed to completion. Worst of all, I had no idea how to find a legitimate editor or what that looked like. During the process I weighed the “pros” and “cons” of traditional verses self-publishing. I submit about twenty query letters and got a couple of nibbles. I also submitted to a small traditional publisher. In the end I chose to abandon the traditional route for two reasons: the average time to traditional publishing appeared to be two to three years, and because the author loses control of his/her story. Above all else, my biggest hurdle was finding an editor. After paying the first editor, I did receive some line edits for less than half the manuscript. I was mostly told that I needed to read through my manuscript again. Big help, right? I worked through the manuscript again with two of the beta readers and went to publishing. When I read The Legend of Jerrod in print I immediately hired a new editor and released a revised version in January 2014. I am a fantasy reader. I also like management/self-improvement and WWII history. In high school I only read what I had to read. J.R.R. Tolkien was the biggest influence to my increasing the amount of reading that I have done in my life. I have also enjoyed Anne McCaffrey, David Eddings, Terry Brooks, J.K. Rowling, and Shakespeare. I love dragons and David Eddings’ works gave me a fascination for druids. As a young man I was captivated by Robin Hood, Ivanhoe, King Author, and Camelot. I am currently trying to read Brae Wyckoff’s The Orb of Truth between writing and revising Amanda’s Quest. I have a lot of books on my shelves and so little time to read. I read somewhere that authors put a little bit of themself in each major character they create. Like Jerrod, I was lost as a youth and wanted more out of life. My wife says that she reads my philosophy in Fraum’s wisdom (which becomes even more evident in Amanda’s Quest). The wizard, Nathanial, and druid, Rhonda, have immense magical power that is tapped by differing methods. Imelrinn is a guardian, a protector. Drin is knightly, pure and honest, with a bit of snobbery (hope I’m not too much like the snobbery). Amanda is not what she seems and has been pretty much unstoppable, within reason. I love hearing from readers about how they interact with The Legend of Jerrod. I would like to be able to write novels for a living so that I could share my stories with readers for their entertainment. I would like to spend six hours a day writing, and then go do some volunteer work, study, and/or take more martial arts training. In the past I have volunteered as a coach and referee for youth sports organizations (softball, baseball, and soccer). I would love to take some fencing or Japanese sword training. I would also like to take some community college courses on areas of interest: art, philosophy, theology, cell phone applications, etc. I may be able to accomplish some of “the dream” after I retire. What is your favorite reader story? Eleven, right? How cute, but I hope that the book started him on a course in his life that will be profoundly improved. Another story comes from a much older man who reportedly loved The Legend of Jerrod, but upon finishing the novel and finding the cliff-hanger (spoiler?) threw the book across the room. He reportedly can’t wait for the second book. I love being able to create an emotional response. My beta readers for Amanda’s Quest our expressing concerns for their favourite character’s wellbeing. Love it! What’s your experience of the fantasy sci-fi network? Where do you see the fantasy sci-fi network in 5 years? The Fantasy/Science Fiction Network (FSFN) is a collection of authors who write in the genre. We promote member authors and try to provide a connection between readers, authors, and their books. Over the next five years I anticipate the FSFN will increase its author membership and develop a reader following so that fantasy/sci-fi readers don’t have to wade through thousands of books in Goodreads/Amazon to find the new books in our shared genre. There are some fantastic people in the network already. D.M. Stoddard competed in solo-acting in high school, took creative writing and Greek mythology in college, and has written dozens of gaming scenarios for his friends to enjoy. He wrote one unpublished non-fiction manual before seeking to have The Legend of Jerrod published. He also painted the sword depicted on the cover of the published book and has a copyright pending for music he and his son composed. D.M. Stoddard studied at the University of Phoenix; the University of Maryland, University College; University of Nevada, Reno; Truckee Meadows Community College; Sacramento Community College; and the Defence Language Institute. He obtained a master’s degree in 2004 and is a retired veteran. D.M. Stoddard is currently employed by the State of Nevada where he reviews and models efficiency improvements for state agencies. D.M. Stoddard is happily married and the father of three wonder children. He has coached and refereed competitive softball and league baseball and soccer. He has also refereed volleyball and football in addition to volunteering time to the American Red Cross and the Northern Nevada Lupus Foundation in the past. He was one of about 180 alumni to receive the 2013 Alumni Community Service Award from the University of Phoenix and has received two awards for his first novel, The Legend of Jerrod. Disillusioned with the thought of becoming a miller, Jerrod sets off to find fame and fortune. After prying a magical sword from the skeletal hand of a fallen knight, he and his new found friends undertake an adventure to recover the secret treasure of the Lost Kings. Accompanied by a wizard and a sage, Jerrod finds himself torn between his love for a thief and his blossoming love for a half-Elvin druid princess. Armed with courage, steel, and magic they battle formidable beasts as they race to reach the treasure first.